It's almost here! GBTA Convention 2018 kicks off in San Diego, California this Saturday, August 11. This year's overall theme at GBTA is "Momentum" and featured speakers this year include tennis legend Billie Jean King and reality show rich guy Kevin O'Leary. Make a coNEXTion with Travel and Transport at GBTA booth #2805. Our one-of-a-kind agent desktop system, which we call BARTT. DVI (Data Visualization Intelligence), a Travel and Transport company, will again be at this year's GBTA Convention to demonstrate how the right combination of data, technology and expertise can result in powerful solutions for business travel programs. Visit booth #2911, take in a demo of this truly remarkable system and meet with true travel innovators who are bringing data visualization and scientific insight to the travel industry. Business Storytelling is Monday August 13 at 9:30 a.m. According to GBTA, this session is "designed to help suppliers step away from the about us slide shows and add real value to their time with buyers." Karen Brennan, Director of Sales – West at Travel and Transport, will be moderating this informative session. Data Analytics and Trends is happening Tuesday, August 14 at 9:45 a.m. CDT. According to GBTA, "any size company looking to manage their travel program using a data driven approach" should attend this session. You should also attend it because it features DVI President Brian Beard as a panelist. The Future of the RFP - Hotel and Meetings is happening Wednesday, August 15 at 12:45 p.m. CDT. According to GBTA, you should attend this panel to "learn how procurement strategies are evolving and what you can do to adopt them into your travel program." Kate Andersen, DVI Director of Account Management & Services, will be a featured panelist for this session. With its perfect location on the Southern California coast, beautiful year-round weather and vibrant areas for dining, shopping and nightlife, it's no surprise that the city is home to many of the top conventions and trade shows each year. 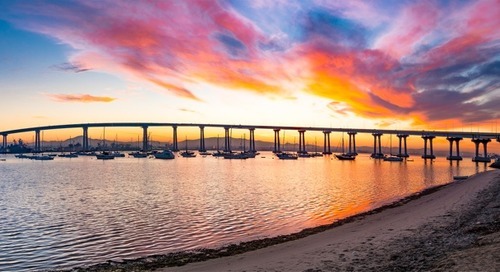 Most importantly, San Diego is a very welcoming city to visitors. Travel and Transport always feels right at home there! We think you should too. If you'd like to learn more about things to do in San Diego, visit the San Diego Convention Center's website, which features a digital attendee guide. If you're at GBTA, we hope to see you at our booth or at one of the many great sessions and events happening throughout the week. If you're not able to make it this year you can still get in on the fun by following the events at insights.travelandtransport.com and on Twitter with tweets from our team @TandTNews. We’ll be using the official GBTA hashtag #GBTA2018.